The fast member of the 3 standard lenses chosen for the original Asahi Pentax camera. It is constructed of 6 elements in 4 groups to Sonnar optical design. It was the second standard Takumar to go into production for export from May 1957 to May 1958. All black and chrome and black regular coloured lenses (for matching AP cameras) were made in 10 batches of approximately 500 to 3,750 copies. It was discontinued in early 1958 when standard lenses of Gaussian design and 55mm focal lengths were adopted by AOCo. Nevertheless it out-sold it's slower rivals, even the new Gaussian designed 55mm f=2.2, which continued to be produced for two years. The original Asahi Pentax camera was provided with three standard lenses, each with a different combination of speed, focal length and optical design. Two, including this lens, were new and the third was based on a lens made previously (since 1954) for Asahiflex cameras. It was an innovative time at AOCo. 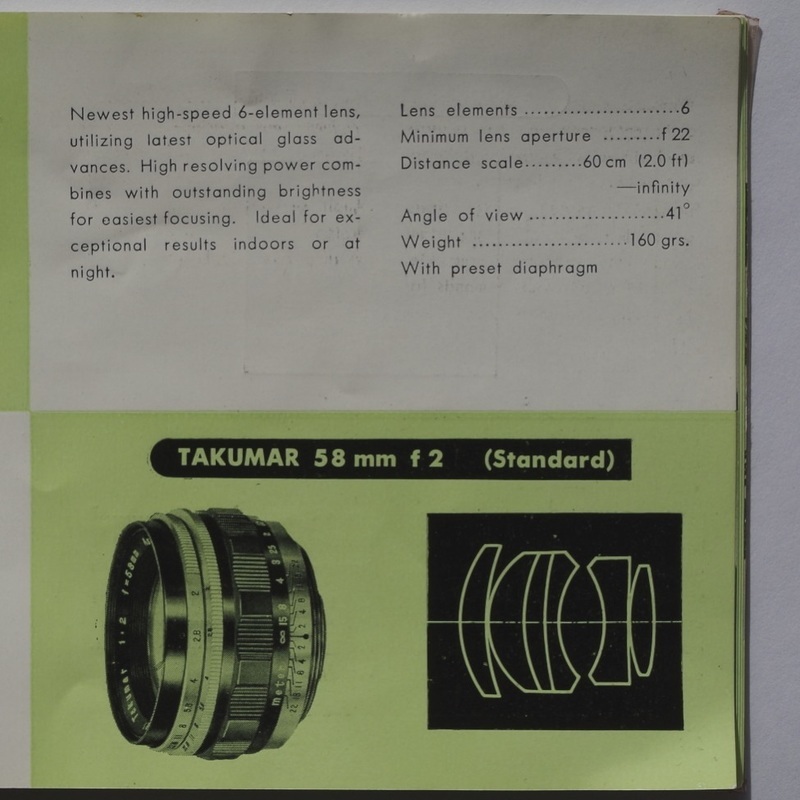 An Infra-Red focus correction mark was trialled on the depth of field scales of this lens but did not appear on other Takumars until the 1960's; although the first batch of the new Takumar 3.5/ 135 was also included in this trial. A new pre-set lens designed with 6 elements in 4 groups (Sonnar). Externally, lenses are black and chrome, or all black. The threaded filter ring is 46mm in diameter and the diaphragm has ten triangular blades. The barrel is made of black nickel alloy. The Asahi Pentax (AP) Instruction Guide states the viewing angle is 41° and weight is 160 grams. Emanuel (1960) records the weight as 5.5 ozs (156 grams) and a copy I have weighs 184 grams. Distance scale units are marked on the left, either in “Meter”, or both "Feet" and "Meter" (from late batch 8 (SN 150800) for export and domestic markets); spelling chosen to suit initial marketing in USA. Distances begin with the infinity symbol and attenuate to the RHS with the following series of numbers. Individual copies can focus significantly closer. Corresponding distance scales on 58mm Takumars are identical. Three chrome rings complete the lens’ external appearance. Two adjacent rings near the front move independently and have uniform fine-knurled edges. Together they operate the preset diaphragm mechanism to set the aperture. On the barrel just forward of the first ring is a red dot used for selecting the aperture. Eight aperture stops in black numerals adorn these rings. No available half-stops or markings (such as dots) lie between these stops. As with all lenses of this age the minimum available​ aperture stop available is f=22. The third and largest chrome ring is fixed. Its rear end is the M42 screw thread camera mount. On the perimeter is a bi-lateral depth of field (DOF) gauge with six numbered f stops on either side of a centre to engage the distance scales on the focusing ring above. Final production copies of this lens have a forward-pointing red triangle marking the central point of the gauge just above a single numeral 2 representing the largest aperture setting. Flanking this triangle are two black vertical lines to indicate the depth of field as read from the distance scale. The remaining set of black lines indicate 5 lesser aperture settings either side. These lines are bent to diverge away from the central point. From SN 135822, normally, copies carry a red "R" (Infra Red focus correction mark. See 4 for exceptions) on the LHS of their DOF gauge. Until SN 138722 this "R" is paired with a short red line pointing diagonally away from the centre as in the above illustration of SN 138204). In all later copies (SN 139050 onwards) this line, (originally an f=4 guideline) now aligns with the lens' axis and becomes the centre point for infra-red focus (i.e. points vertically). Serial numbers always contain 6 numerals after the prefix (No) and in the time between producing batches 4 and 5 AOCo re-positioned them on the nameplate. They appear before the name "Takumar" on nameplates with numbers beginning 13xxxx " but after the lens description (i.e. "1: 2 / 58mm" No XXXXXX) with numbers 14XXXX and beyond. Distance scales on lenses in later batches produced are dual ("Feet" and "Meter") starting in late batch 8 (approx. SN 150800); earlier copies are metric and the early font of "M" is rounded. In this lens the intermediate stage was skipped. (i.e. producing lenses calibrated in "Feet" only for export). ​Black copies (8) from different batches (3,4,5,7&8) can have completely different combinations of features. One (batch 3) with a infra red mark with the diagonal "R", a metric scale and serial number before the name. A third (batch 8) with a dual distance scale and no infra red mark. The following SN on all black copies have been observed 135742, 138406, 141325, 141982, 147917, 149721 and 150874. Maximum aperture "2" is shown twice (left and the right) of the centre mark. Inner guide lines for this aperture "2" are bent distally to point away from the centre mark. Centre mark is coloured red and "lollipop" shaped (i.e. a round dot on a stick rather than a triangle). LENS PRODUCTION (∑ lenses) ∑n = 275 Serial Numbers (SN) observed in 11 batches covering 10,625 SN min.< ∑ lenses < 12,844 SN max. A pre-production copy with early "Asahiflex" styling in the Asahi Pentax (AP) Instruction Guide description (below). In production copies the depth of field scale is simpler.